I'm still out here in Japan to cover TGS, and even though this is just my first time in the country, I'm already itching to come back. You only need to walk a few blocks to see video game and anime references everywhere, as Tokyo is constantly alive, with a populace that openly embraces technology. Naturally, I had to seek out a few popular arcade games that haven't come westward yet, most notably Pokken Tournament, which is currently set for a Wii U worldwide release early next year. The first thing you'll probably notice about Pokken Tournament is that it doesn't use a traditional arcade stick control method. 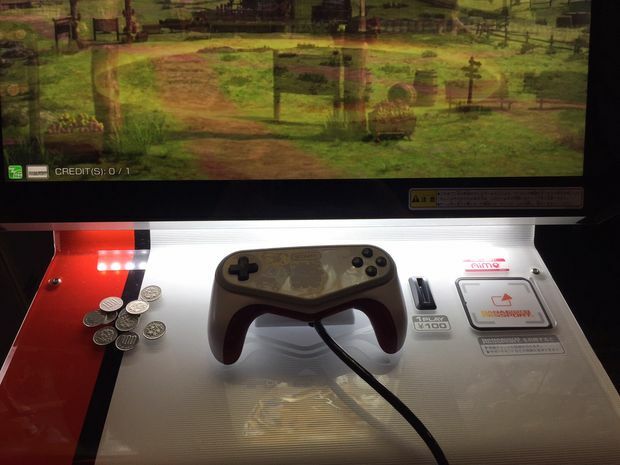 Instead, the game is tethered to a pad, with two triggers, four face buttons, and a start button. It took a bit of time to get used to, but it's not necessarily unwieldy. This build was the latest one available, which included Luchador Pikachu, a character that was unveiled during the announcement of the Wii U edition. The way the game works is by way of simple one-on-one bouts, which play out in an open 3D arena. Each screen focuses the camera on that specific player, which is a tad weird at first, as I was constantly looking at another person or CPU's fighter during my first few sessions. Once you pick that concept up it gets rather easy, and you can move about the battleground with ease with the d-pad. Attacks are actually a lot more in-depth than you'd think. Y and X seem to trigger normal abilities, from combos to launchers, B is the jump button (every character has different physics to deal with, like the floaty Gardevoir), and A is a special attack, similar to the Smash Bros. series. Every single one of these buttons can be modified by press the d-pad in a certain direction, or by jumping. For instance, pressing forward and A may launch a Dragon Ball Z style projectile your opponent's way (leaving you wide open in the process), and a neutral A will fire a smaller, quicker shot. L summons a quick support character (my build had Emolga and Fennekin), and R is used for blocking. I spent over an hour with the game during my first session, and I was surprised how different every character was. Sure, the way abilities are executed are all the same (directional commands), but there's so much nuance to each Pokemon it's crazy. As I mentioned before, Gardevoir has a completely different feel than say, Luchador Pikachu, who even feels slightly unique compared to vanilla Pikachu (mostly through wrestling-style grappling moves). Having played some of my sessions with our own Steven Hansen, we both agreed that Pokken was deeper than we initially suspected it would be. There's a number of different counters to everything, and during some particularly heated sessions during my time with other Japanese residents, I saw some fierce utilization of tactics employed in other fighting games -- like wake-up game and cross-ups. If you happen to be in Japan and want to play Pokken Tournament, each session will run you 100 yen (slightly less than $1 US) in arcades, and Bandai Namco sells a card called a "Banapassport" for 300 yen that allows you to save your progress after each session. Your money will go a long way, as I played 45 minutes once off of one credit, beating challenger after challenger, and even a direct versus game between two cabinets can last up to five minutes. Of course, you could also just wait for the Wii U version next year.